Home Security Systems | Alburquerque, Rio Rancho NM | Southwest Security Inc.
A custom-designed home security system from Southwest Security is created to answer your concerns and keep your home safe. From a studio apartment to a five bedroom home, size doesn't matter to us. Home security companies offer packages and programs that you have to make work for your home even if you have a different concern. We take a different approach. Homes without security systems are three times more likely to be the focus of burglars than those with them. Is that something you need to be worrying about while you're handling family outings or going to work? Our home security systems are individually designed, based off of an evaluation of your home and the security requirements that you give to us. With licensed, experienced security designers giving you recommendations to help give you the greatest value for your money, we can work with you to create a plan that suits exactly what you want. 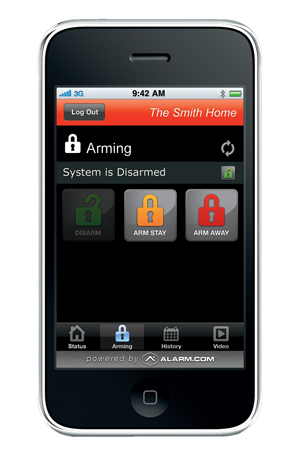 Options let you fine-tune your security system to match your needs. 24-hour-burglary monitoring is what you may have come to expect from home security companies, but what about fire and smoke monitoring? Carbon monoxide, flood or temperature warnings, or even medical alert monitoring are all options we offer. Protecting what matters most to you isn't just about your possessions and Southwest Security understands that. From the latest technology in carbon monoxide monitoring and two-way voice communication medical monitoring to magnetic locks, we create solutions to the problems that destroy your peace of mind. Convenience is a feature everyone looks for, and we offer that with remote access. Not only can you use a simple login on your smartphone to access your video monitoring, you can verify alarm events, remotely unlock your door or even control the temperature in your home. Southwest Security wants to ensure that our services are making your life easier in every way we can. Contact us today to learn more about our personalized services.